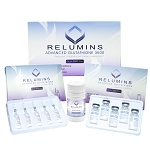 Introducing a revolutionary NEW product from Relumins Labs, the premier supplier of the finest Glutathione products available on the market today, the first ever, high-dosage Glutathione vial approved by the United States FDA, Relumins Advanced Glutathione Oral-Vials 7500mg in Tangerine Flavor. 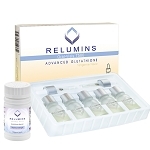 Relumins Advanced Glutathione Oral-Vials are taken orally. 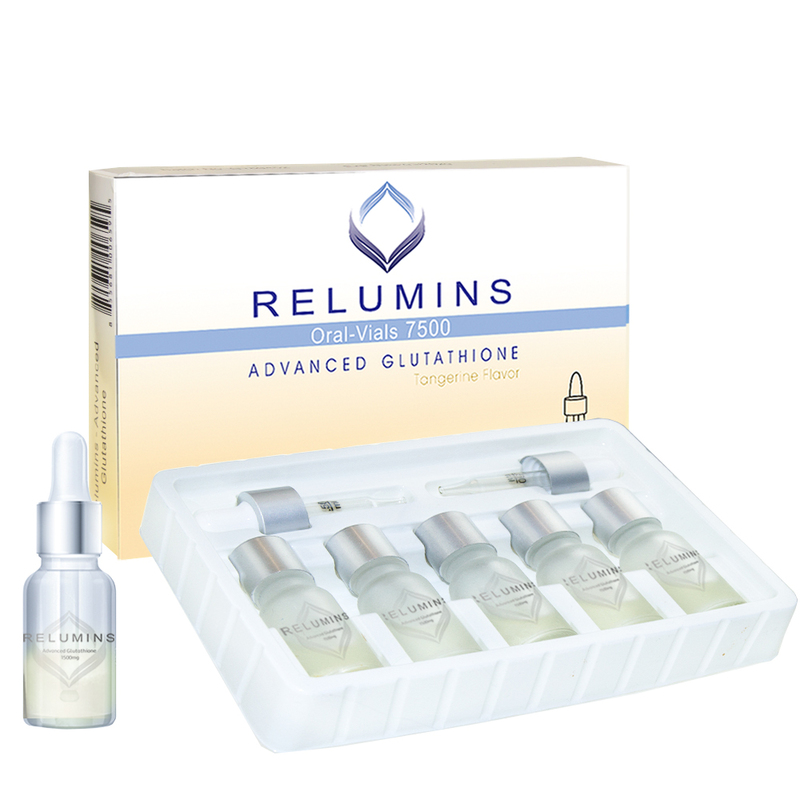 When taken as a liquid, glutathione is absorbed through mucous membranes which quickly delivers a high-dosage of glutathione directly to the bloodstream. 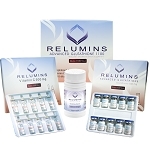 This method of injestion provides peak elevations of serum glutathione which is equally as effective as glutathione IV, injection or sublingual glutathione and with a delicious tangerine taste. 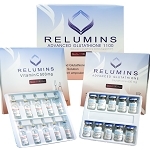 Each set contains two sterile oral administration droppers and five sterile glass vials each containing Relumins Advanced Glutathione Oral-Vials, which contain 1500mg Glutathione and 500mg Vitamin C Booster in Tangerine Flavor. 1500mg of Glutathione is twice as much as any other Glutathione available. ***What is that smell? The smell is completely normal. You can tell the product is made with high potency glutathione because of the sulfur smell, glutathione is a sulfur donating molecule. Competitively inhibits melanin synthesis in the reaction of tyrosinase and L-DOPA by interrupting L-DOPA's ability to bind to tyrosinase during melanin synthesis. 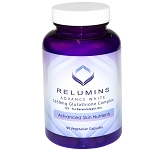 These results indicate that glutathione inhibits the synthesis and agglutination of melanin by interrupting the function of L-DOPA.It is the master anti-oxidant that helps fight free radicals which cause skin damage and contributes to good liver function. A potent antioxidant and skin-soothing agent that can improve the appearance of signs of aging. Allows for 3 years shelf life & enhanced bio-availability. 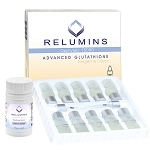 Draw out 1 ml of the Relumins Advanced - Glutathione Oral Vials. Place liquid in mouth, hold in mouth and under tongue, then swallow. Repeat procedure every morning for 6 days to finish the vial. The package of 5 vials should last One month. Repeat procedure every morning and evening for 3 days to finish the vial. The package of 10 vials should last One month.